Before learning about this in class, I originally thought basil was a basic plant that went on top of fancier meals to give it a slight fresh taste on top. Personally I never saw the point in basil or why it was put on top of these foods, and sometimes would just brush it off of my meals if it came with it. I knew it was a herb but I did not know of its benefits or why it was so commonly put on top of meals such as pasta or chicken. Through learning about basil I have come to appreciate its wide variety of uses and importance among Italian cuisine, which I had no clue about prior to learning about basil in class. Basil is a key herb ingredient that is used in Italian cuisine. It is used for its strong scent and taste and also because of its many health and nutrient benefits. There are several chemical aspects that play a huge role in basil and its importance when it is used in meals. Fresh basil is very commonly used in recipes and is added to foods at the very last moment of cooking. Basil has various scents based on the different types of the herb, but all of them are full of essential oils and include great amounts of Vitamin A, K, C, magnesium,, potassium, iron, and calcium. Different types of basil such as lime and lemon basil have a very strong potent smell and taste which comes from their high concentrations of limonene. Another type of basil called sweet basil, which is most commonly used in Italian food, contains high concentrations of eugenol which is a chemical agent. Overall basil and its chemical components have many health benefits such as anti-inflammatory, anti-aging, and antibacterial qualities and basil is nutrient heavy but calorie light. The word basil originally comes from the word Basilius which is Latin and means the word royal. Basil also can be seen through the word basilica, which is usually a church, and basil was at often times placed in pots with holy water and placed outside of buildings and churches, which shows the religious significance it had. Since basil was seen as this holy and kingly plant it has many religious implications and this can be inferred through the story of Lizabetta and The Pot of Basil. In the story, Lizabetta’s lover is killed by her brothers and upon discovering his dead body she takes his head and puts it in a pot and places basil on top to cover her lover’s head. She waters the plant with her tears and this causes the plant to grow beautifully, even though it is growing from something dead. This story really exemplifies the importance basil had in Italy and how basil was seen as a rich and holy source of nutrients. Even though her lover was poor when he was alive, in death he was beautiful and rich as the plant grew out of his head. Basil was also sometimes placed in the hands of the dead to ensure safe travels into the afterlife in Europe and different variations of the way basil was used for the dead was seen in places such as India, Egypt and Greece. Culturally basil had a high significance in how it was handled and because of how it was seen as such a royal and holy food, this is why it was handled with such care and used in special cuisine situations. When looking at both the chemical and cultural aspects of basil, I realized that basil is both heavy in nutrients and minerals and has many health benefits and basil also is considered holy and royal which I think tie together very well. When something is looked at as holy it comes with the implications that it is good for the soul and helps to keep one healthy and live a great long life. Now when trying to live a healthy life people try to eat nutrient rich foods that do not have a lot of calories and come with many benefits. 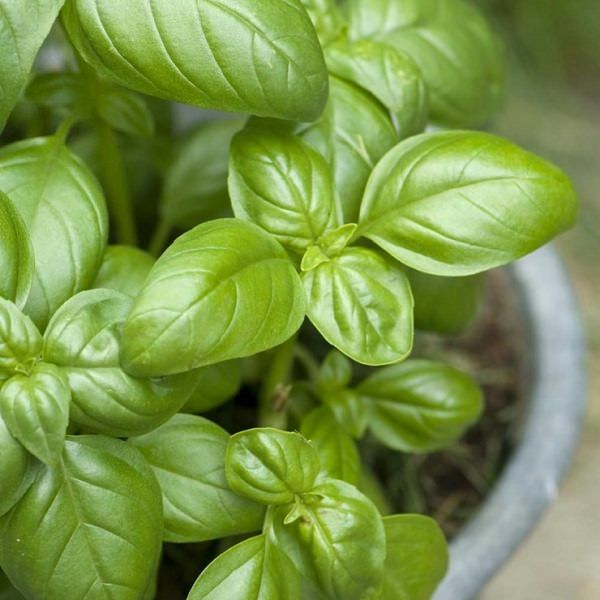 Basil is a herb that comes with all these chemical components which causes it to be a healthy food that can be placed on top of foods, but it also is considered a kingly herb that is holy as seen through the story of Lizabetta and the Pot of Basil. Overall I think basil poses this wonderful mix of both chemical and cultural aspects and makes this aromatic food a key factor within Italian cuisine. Nordqvist, Joseph. “Basil: Uses, Benefits and Nutrition.” Medical News Today, MediLexicon International, 3 Jan. 2018, www.medicalnewstoday.com/articles/266425.php. “Basil.” Wikipedia, Wikimedia Foundation, 16 Apr. 2018, en.wikipedia.org/wiki/Basil. I also talked about basil so it was very interesting to see your perspective on it. I enjoyed reading about the many health benefits of basil and your integration is very informative. It’s interesting to read about the chemical properties of basil, I forgot about the different types of basil including lemon and lime which come from limonene.